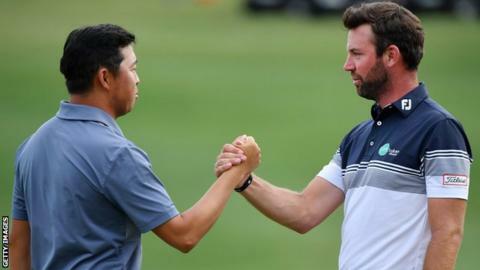 Scots David Drysdale and Scott Jamieson had to settle for second and third place respectively as David Lipsky won the Alfred Dunhill Championship at Leopard Creek in South Africa. Jamieson was the overnight leader, but his final round of 72 left him on 11 under par for the tournament, three behind American Lipsky. Drydale's round of 67 moved him from fifth to second on 12 under. English pair Ben Evans and Oliver Wilson were joint-fifth on eight under. "I would have taken it at the start of the week," Drysdale told the European Tour. "Overall a good performance. A couple of lucky breaks here and there but overall delighted with my week. "From tee to green, the last two or three months have been good. The putting has been a little bit erratic now and again but I holed my fair share this week. I was steady off the tee and hit a lot of good iron shots. "I took that shot on at the last trying to make a three and you never know what might happen."